The book under review, Resurrecting Punjab, represents K.S. Chawla's first-hand account, as a journalist, of political events spanning about 50 years, beginning around the 1970s. The author covers various political events and his personal interactions with Punjab politicians. There is no better way to convey history to the younger generations than through narration of eye-witness accounts. Chawla does that superbly. The eye-witness accounts add authenticity and are gripping. In the four-page 'Introduction', Chawla talks about the post- Independence migration of people from West Punjab (Pakistan) to East Punjab (India) and their rehabilitation. He discusses how Partap Singh Kairon, the then Chief Minister of Punjab, made efforts to industrialize East Punjab and strengthen agriculture by establishing Punjab Agricultural University in Ludhiana, which helped usher in the 'Green Revolution' in the late 1960s. He points out that successive state governments have neglected the farming community's welfare. Youth emigration from Punjab to foreign lands in search of greener pastures and the current drugabuse epidemic in Punjab are also prominently mentioned in the Introduction. K.S. 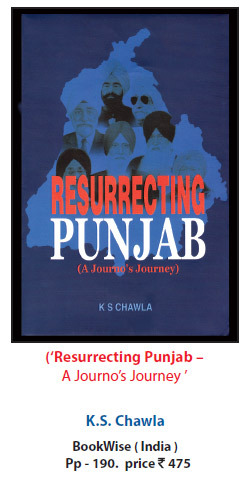 Chawla Chawla has covered, in the first 21 chapters, the lives of politicians and their interactions with one another in the political arena of Punjab after Independence of India. Chapter 22 titled "How became a journalist" is obviously not related to political events or politicians. It is an interesting account of how or why the author chose journalism as a profession. At the end, in the Appendix, Chawla describes the harrowing escape of his family from West Punjab (Pakistan) to East Punjab (India) at the time of Independence (bifurcation of British India into India and Pakistan) and the struggles and hardships that his family had to face. Chawla's account of happenings is quite riveting. Chawla talks about the post-Independence migration of people from West Punjab (Pakistan) to East Punjab (India) and their rehabilitation. 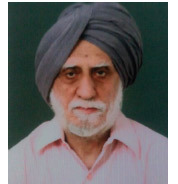 "I had very good relations with Talwandi and one day, he came to tell me that he had talked to Jathedar Gurcharan Singh Tohra and CPM leader Harkishan Singh Surjeet and told them that Badal would not come out of depression unless he was declared chief ministerial candidate of the Akali Dal for Punjab." 'As soon as we told him (Badal) about our decision, Badal jumped up in his bed and his depression vanished.' 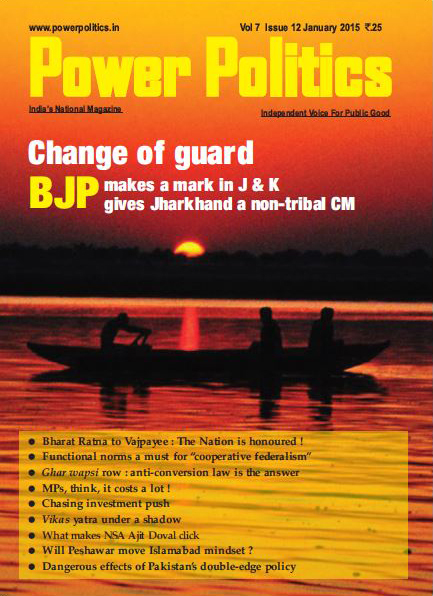 The credit for bringing Badal back to Punjab politics solely goes to Talwandi." While the book is generally well written, some typos and convoluted sentences, apparently missed during proofreading, do exist. K.S. 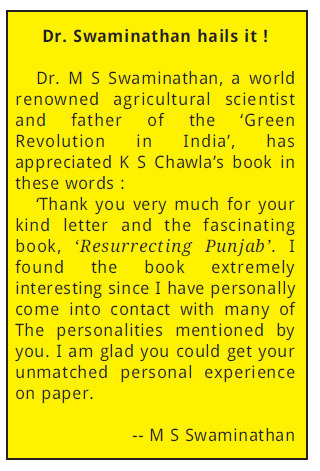 Chawla should be commended for putting in writing his experiences and interactions with Punjab politicians. I am sure the younger generation will get to read the history of Punjab politics and Chawla's contemporaries will reminisce the important events that have shaped Punjab.